Stanley P. Jaskiewicz, left, hands off his Philadelphia law firm’s donation of travel mugs for homeless men to a driver for St. John’s Hospice, the Catholic Social Services-run ministry to homeless men in the city. 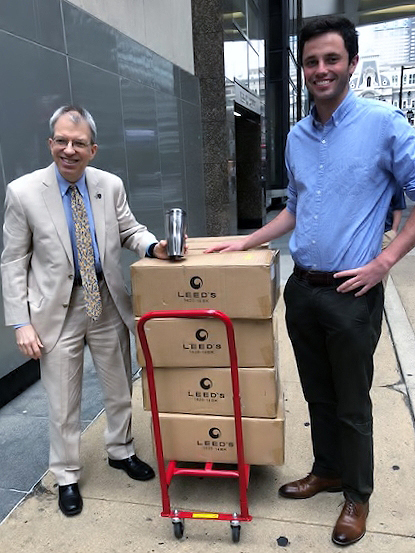 The Philadelphia law firm Spector Gadon & Rosen, through the efforts of attorney Stanley P. Jaskiewicz, a member of Corpus Christi Parish in Lansdale, donated several cases of travel mugs to St. John’s Hospice for use by the men served there. The firm also donated mugs to other nonprofits including Manna on Main Street (where Jaskiewicz served as a board member for many years), Corpus Christi Parish and St. Joseph’s Preparatory School.